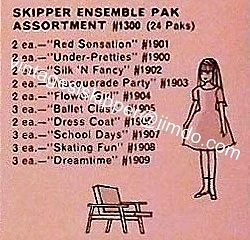 Straight Leg Skippers were also sold in "Dressed Doll" boxes. Dressed dolls wearing the fashions #1900, #1901, #1902, #1903, #1904, #1905, #1906, #1907, #1908 and #1909 were part of the #1082 Master Assortment"/"Skipper Ensemble Pak Assortment #1300" which consisted of 24 paks mentioned in the 1964 Mattel dealer catalog. Some more dressed dolls in their boxes were available covering fashions from #1910 - #1922. Not all of these dolls came with headbands. 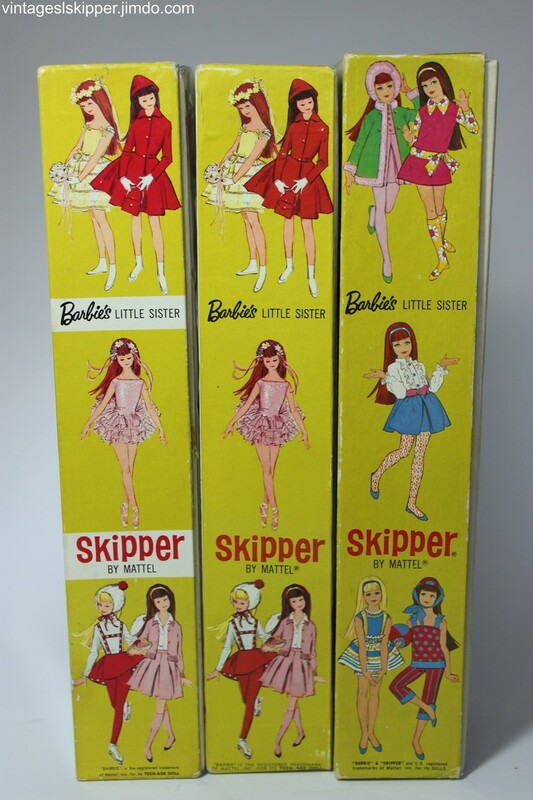 The Skippers included in the Dressed Doll Boxes were exceptionally pretty, they all had several rows of bangs and a vivid make-up. 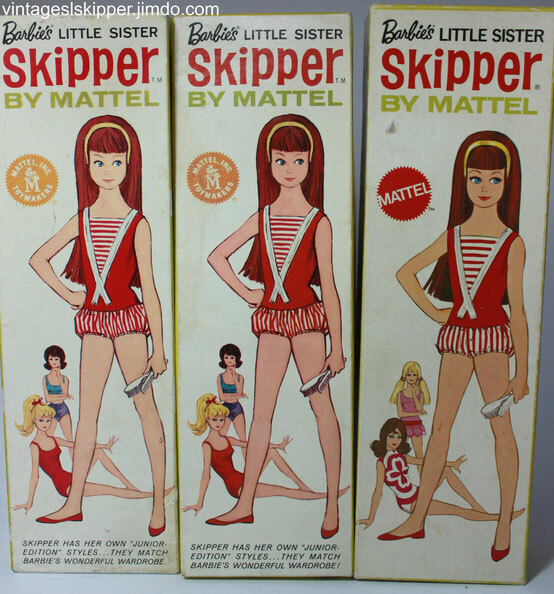 Some Test Market Skippers were found in Dressed Doll Boxes. Dressed doll boxes came without box liners. The dolls were sewn into the boxes with either red or black threads, which is why the box bottoms have two small holes in them. 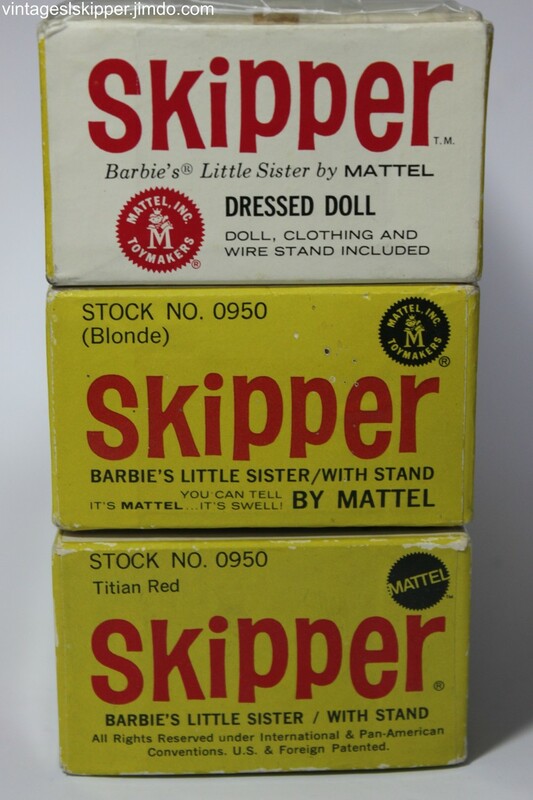 An oval sticker with the writing "Skipper GENUINE BARBIE'S LITTLE SISTER DOLL By MATTEL 19xx - NAME OF FASHION" and the Mattel logo was affixed to the clear cover which was placed over the box bottom. 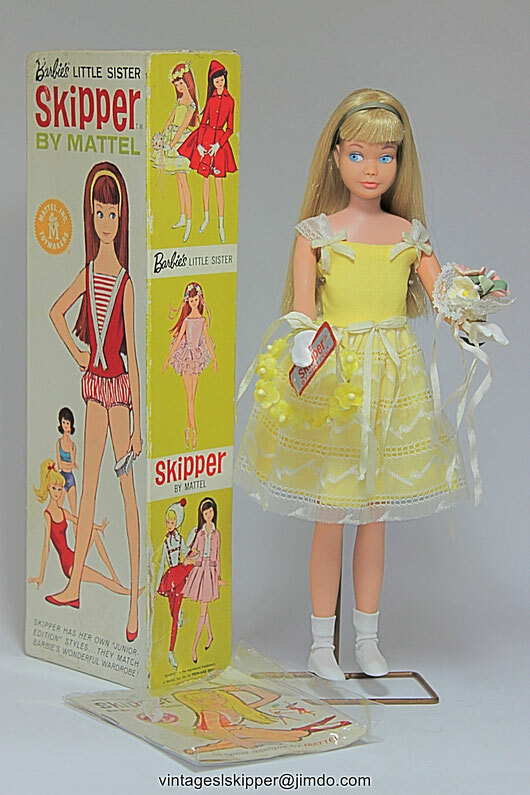 The hair color of the Skipper doll included wasn’t mentioned anywhere on the box. 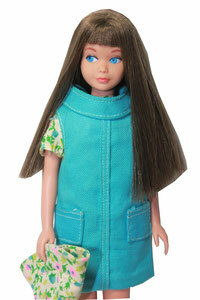 Dressed doll boxes are extremely rare. Comparison of: "Dressed Doll" boxes, regular boxes, and re-issue boxes. 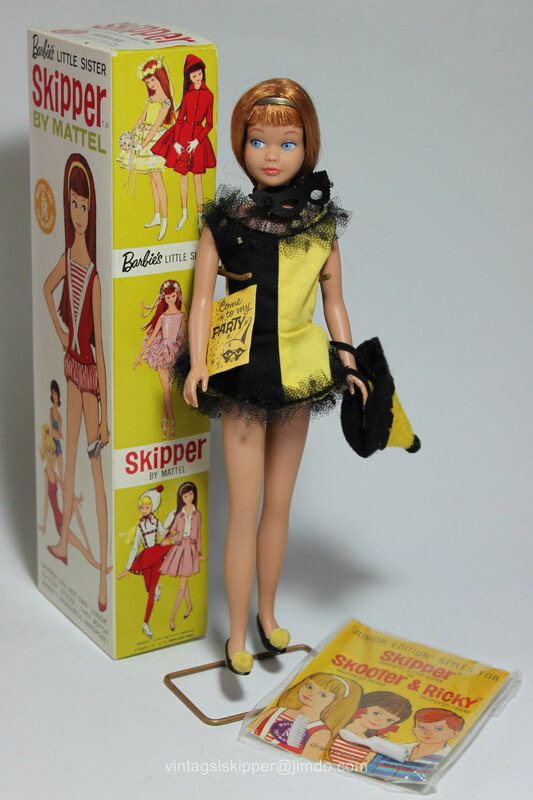 Dressed box Skipper doll wearing "School days"
Above: Exceptionally beautiful brunette "dressed doll box" Skipper dressed in "Red Sensation". 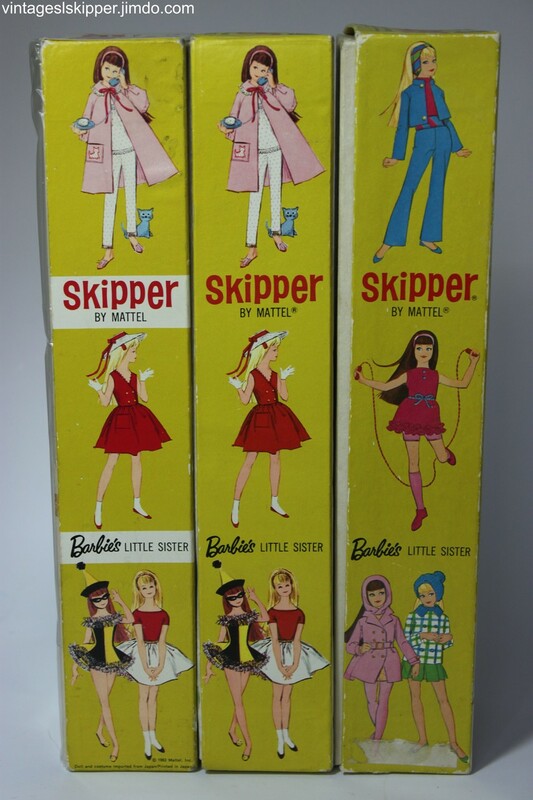 Two "dressed doll boxes" Skippers. They both have several rows of rooted bangs. One comes with the fashion set "Ballet Class", the other one with "Red Sensation". Above: Pretty blonde dressed box Skipper doll wearing "Flower Girl"
Above: Gorgeous redhead (with an orange scalp and oxidized hair) dressed box Skipper doll dressed in "Masquerade"